Icy Gems is a Microgaming platform based slot game for which reels are 5 and Paylines are 25. Total coin for the slot is 25 and coin range is £0.25 – £125 per spin. Play this slot using your smart phones, tablet or desktop at Online Casino Microgaming. Icy Gems video slot gives you a chance to win a whooping 2,500 times on your total bet. The game features a bonus round i.e. Free spin feature which could get you 15 to 30 free spins if triggered. As the name suggest, Icy Gems is a cool and clean deigned slot game which offers great winning combinations to players. The background of Icy Gems slot looks amazing coz you will see beautiful snow everywhere in the background. The game contains A to J symbols as well as 4 high paying gemstones. 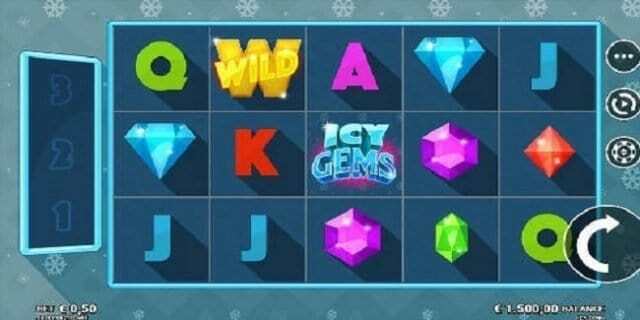 The Icy Gems logo is the highest paying symbol of this video slot powered by Microgaming which offers you 1.5, 10 or 50 times your total stake for 3, 4 or 5 symbols across your Paylines. The symbol ‘W’ is the wild symbol and it replaces all other symbols on your reels. On every winning, this symbol will be added to the Symbol Storage meter and you will be rewarded a re-spin. The game consist a Super spin feature. This feature is activated when you collect 3 successive winners during a re-spin. During the Superspin, only symbols located in Symbol Storage blocks will play and once you got same matching symbols during this feature, you will win huge cash prizes. Icy Gems slot is a simple but solid video slot machine. This is a very volatile game which may give you 1,210.5 times on your total bet on every free spin or e-spin or superspin.